The presence of sweeteners is ubiquitous in modern day food and drink. Manufacturers of food and beverage aren’t dumb, they know we humans have an insatiable appetite for sweets. In order to satisfy our sweet tooth without ruining our health and gaining weight (your body stores sugar as fat), we must choose natural sweeteners and avoid the artificial and otherwise unhealthy. I’ve identified the best and worst sweeteners with a brief description of each. This article is in relation to sweetening your smoothies, but can be applied to anything you eat. Once you know which sweeteners are suitable to consume, and which to eschew, you’ll be able to easily identify healthy verse unhealthy food. By only using good and natural sweeteners your health will benefit and you won’t feel guilty when indulging on sweets. There are several different “sugar substitutes” for you to choose from, experiment with each to determine which one your taste buds prefer. An herb from the leaves of the South American stevia plant, it has zero calories, zero sugar, and no effect on blood sugar. Stevia is considered a no glycemic sweetener because it registers a zero on the glycemic index. Stevia comes in several forms, each of which is anywhere from 25 to 300 times sweeter than sugar, therefore you need very little to sweeten your smoothie. White stevia granules or crystals are the most popular form, but it’s also available as a liquid, and green powder, which is the pure broken down herb. Remember, a little goes a long way; so start out small and work your way up. For centuries people have utilized honey as a sweetener. Honey is rich in natural enzymes and antioxidants and contains a wide range of minerals such as iron, calcium, zinc, potassium, magnesium, copper, chromium, and phosphorus. 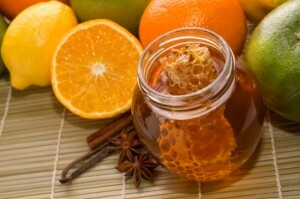 Honey does contain a fair amount of fructose (fruit sugar) and should be consumed in moderation. Word of caution: if you suffer from conditions relating to excess sugar consumption such as candida you should avoid honey and go with a low to no glycemic sweetener. Stick with local and/or organic honey. I get mine from my local farmers’ market. Most honey in the plastic bear tubes you get from the grocery store actually contain very little real honey and are laced with undesirable additives. Like honey, 100% pure maple syrup contains an array of healthy vitamins and minerals. Maple syrup helps boost your antioxidant defenses, is good for your heart, and improves your immune system. It’s also beneficial for the male reproductive system. Maple syrup does contain natural sugars and shouldn’t be used too liberally. Find a local source of maple syrup, or better yet tap your own trees! My favorite way to sweeten my smoothies is through a variety of delicious fruit. The natural sugars present in fruit are packaged with fiber and other substances that slow down sugar absorption and prevent a “sugar spike”. Ideally, fruit is all you need to sweeten your smoothies. Here are a few other good sweeteners to consider. I don’t have personal experience with them, but have read and heard good things. Organic blackstrap molasses, coconut palm sugar, sucanat, and Lo Han extract. If you have experience with one of these sweeteners I’d love to hear about it in the comments below. The bad sweeteners are those you want to avoid like the devil. Sugar wreaks havoc throughout the body and artificial sweeteners might be even worse, and studies are showing they don’t actually help you lose weight, but rather just the opposite. 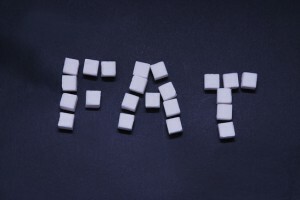 White table sugar extracted from sugarcane and beets has no place in healthy diet. It’s been referred to as the cocaine of the food industry. In moderation, white sugar isn’t so bad, but with its presence in so many foods today, the average person ends up consuming far more than they did just 100 years ago. When I see a smoothie recipe that calls for a tablespoon or two of white sugar I cringe. Besides refraining from adding pure sugar into your smoothies, you also want to avoid sweeteners rich in sugar such as chocolate syrups, caramel, and ice cream. About 15 years ago agave nectar burst onto the health scene and was heralded as a natural and healthy sugar alternative. Unfortunately, this is far from the case. Dr. Mercola was one of the first to sound the alarms about agave as a highly processed sugar detrimental to health. Click here to read why it’s actually worse than high fructose corn syrup. This sinister sweetener has crept into food products far and wide. I believe by now most people know to avoid this, but often don’t realize just how omnipresent it is. Be sure to check your labels to avoid high fructose corn syrup and be aware of any new names its being referred to as. There are plethora of artificial sweeteners on the market today. The more popular ones include Sucralose, Aspartame, Saccharin, Splenda, and NutraSweet. These may contain zero calories, which you would think would help you lose weight, but that’s not the case. These artificial sweeteners are foreign to the human body, cause signals to get crossed, lead to weight gain in the long run, damage organs, and are known excitotoxins, which are detrimental to the brain. A good rule of thumb for all food and drink also applies to sweeteners, stick to what is naturally occurring in nature. Moderation is also good to keep in mind as mentioned above with honey and maple syrup. By cutting the bad sweeteners our of your diet, reducing sugar consumption overall, and sticking to the natural, good sweeteners, your health will surely improve. I’d love to hear your thoughts on sweeteners. Please leave a comment below. Cheers! Agree w/ all points you made except for Sucralose (Splenda). I’ve gone back and forth on this one but based on my research, there have been no studies done to prove any type of negative health effects. While some of the other artificial sweeteners you mentioned have caused cancer in large doses in animal studies, Sucralose seems to be safe based on the latest and greatest evidence. Thanks for the insightful feedback. I’ll dig a little deeper into Sucralose and possibly update this blog post based on what I uncover. Sound Good, Ryan … will be interested to see if you uncover anything. Two of my most trusted sources, Dr. Mercola and Mike Adams of Natural News aren’t too keen on sucralose. Be careful with Splenda. I was using it every morning in my coffee. I was having severe headaches every day. Nothing would take them away. My doctor did a neuro work up including a brain MRI. All was normal. It was not rebound headaches from taking pain meds every day for the pain. My mother told me a friend had severe headaches too and stopped usuing Splenda and the headaches stopped. I stopped the Splenda and my headaches stopped. My daughter in law was having severe headaches and asked me what I take for migrains. That didn’t work for her either. Then I asked her if she usues Spleda and she did. When she stopped it, her headaches stopped. This is an adverse reaction to it that doesn’t seem to be mentioned anywhere. How good could could Splenda be for the brain??? I have fibromyalgia and recently notice that a diet soda I was drinking was switching from aspertame to suraclose sweetener. At that time I realized that I no longer enjoyed the flavor or the horrible after taste I was left with. I have been using sweeteners like sweet n low and Splenda for years so was shocked when the taste change to where I no longer liked it. So I stopped drinking soda except rarely once in awhile,but I went back to regular instead of artificial sweetners. Well I saw a complete difference in my pain levels. I also for some reason now have a very bitter taste left after drinking anything with regular sugar in it and sometimes with sweet foods. It blows my mind how something we put in our body’s make us have so many issues. I so wish I hated the taste of Diet Pepsi. I am absolutely addicted and truly believe the suraclose made the addiction worse. I too have FMS and suffer from chronic pain due to failed back surgery syndrome and the last time I quit for 6 months felt great. I’m trying so hard to ween off but it is so difficult. Maybe I missed it but I didn’t see any info on Truvia. Would love your feedback as I’ve been using it regularly as a sweetener. Organic blackstrap molasses is a good sweetener. I didn’t highlight it in my article because I don’t have much personal experience with it. Do you use it, what do you like about it? It does appear to contain a fair amount of nutrients. Ryan, I eat organic blackstrap molasses when I have a craving. It’s an acquired taste and goes well with peanut butter. Also, can be used in smoothies, adds color and taste so use a little. I am HIV +ve, and anaemia is a recognised problem/tendency for some with HIV. My Hb is at top end of the level…a surprise to the docs. But of course it makes sense….processed sugar is the rubbish extracted from sugar cane….all the goodness in sugar cane is in the molasses. It really is a veritable superfood to be taking to add to the sweetness we all like to have a bit of in a day. It is a bit of an acquired taste,but I add to savoury foods, cooked vegs, added at serving time along with raw garlic,turmeric powder, spirulina and coconut oil. To my taste buds (having helped them to get out of their programmed ‘box’) they all blend in nicely, with added satisfaction pschologically of ingesting so much nutrition in the process! Thanks or sharing your experience with molasses. I actually started using it lately by stirring into raw milk along with an egg yolk – yummy! I’ve also added to a few smoothies. Once I get a little more experience with it I’ll likely amend this article and recommend along with the other sweeteners I endorse. And yes, it is very nutritious. Ryan, I make green smoothies a couple times per week with no added sweetener, except for frozen fruit (usually blueberries). Adding organic coconut milk really enhances the flavor. Often add anti-inflammatory spices which my 8 yr old grandson will devour! Smoothies can pack a lot of fructose if you use liberal amounts of fruit so I keep this in mind. Thanks for your posts! Joyce, what are the anti-inflammatory spices which you use that your grandson loves? Where I live, palm sugar is an ingredient in many desserts, used especially in combination with coconut milk, such as in the gula Melaka. If you’ve ever had the last, you would know that palm sugar and coconut milk together is a union blessed, sacred and pleasing in the eyes of God and men lol. Which explains why I’ve never thought of putting palm sugar into any of my smoothies, which I typically make with a base of yoghurt and generally leave unsweetened. I see now that i am an old, boring food purist. The next smoothie I make (in about an hour) will have yoghurt, peaches, cocoa powder and yes, palm sugar! I recommend forgoing a sweetener in your smoothie if you can. Sugar, even healthy varieties, isn’t exactly good for the body. Hope your smoothie was delicious! One date should sweeten anything. I used to use two; but, that is too sweet for me now. Where does dextrose fit in? Dextrose is essentially glucose or refined sugar, which I personally don’t advocate. What I’ve found is that most of the commercially available dextrose is derived from genetically engineered corn through and a long complicated manufacturing process. Not cool. If you are able to find an organic source it might not be too bad. For now, you’ll have to do more research yourself. What is your take on Monk Fruit? I gave up Splenda/sucralose when I realized that it was giving me major migraines. I used to use the zero calorie water enhancers with sucralose and while my weight went down, my headaches went up! I honestly don’t have any experience with Monk Fruit. From what I just read, if you like the taste it imparts, and are able to procure an organic source, it’s a viable sweetener. I’ll have to do more research and update this article. Is there is a distinction between honey and unpasteurized honey, in terms of glycemic index. From what I understand, once honey is pasteurized it loosed all it’s healthy benefits and the glycemic index is higher, while unpasterized honey keeps it’s benefits and has a lower glycemic index. This is what I read, I’m not an expert or anything. Unpasteurized honey might not be available everywhere, but it is where I live. That’s a great question and one I couldn’t find a definitive answer for. I suspect there’s either no or little difference in glycemic index between processed and unpasteurized honey. However, unpasteurized honey definitely has more health benefits as the enzymes and other nutrients that get destroyed when processing are in tact. I am simply trying to eliminate all sugar from my diet except that which is in fruit and I am using moderation there too … I believe I can train my body to not crave sugar just as I trained it to crave sugar. Loved the information, thanks for sharing. Does anyone have a great smoothie recipe that can conquer a chocolate addiction that is truly healthy? That’s certainly a worthy goal. My sugar cravings decreased significantly after changing my diet, but aren’t gone completely. When I do consume sugar it’s the healthy variety – honey, maple syrup, fruit. Apart from having one healthy smoothie a day, which approximately follows your guidelines, I have a number of hot drinks in the course of the day and, after being made aware by my doctor of how much sugar I was having in total, went onto artificial sweeteners, mainly Hermesetas and more recently Canderel Stevia. Are any of these healthy and what (good and bad) ingredients should I watch out for? I was brought up on hot drinks and now, after giving up added sugar, consume a high amount of artificial sweeteners. I read your newsletters and find them trustworthy and inspiring and would welcome your advice. I don’t consider stevia an artificial sweetener (especially the green powdered down herb) because it’s found in nature. White stevia powder and extracts aren’t as “natural” as the herb, but close enough in my book. Therefore, to avoid sugar, I would stick with stevia. I see that Hermesetas has a stevia line. I don’t have any experience with either of these brands. My advice is to ensure they’re quality, reputable, and preferably organic. I have tried the new Hermesetas stevia artificial sweetener and dislike the flavour as with the other stevia artificial sweeteners I have tried. I take your point that you cannot beat natural ingredients and can see that, if a sweetener has a nasty chemical after-taste, it cannot be doing you any good. Apologies to Hermeseta, whose original sweetener is still my most favoured in hot drinks. My most favoured sweetener in smoothies is a good crispy apple. I have taken to using fresh broad-leaved parsley and find a natural piece of fruit gives sufficient sweetness and flavour to offset adding a good healthy portion of greens. I have used stevia, coconut sugar and honey. Those are all good options, Pris. What about organic sugar? I think it’s Wholesome Sweetener brand. They sell it in big bags at Costco. I think Costco even has a store version of organic non refined sugar. I think it’s still sugar cane but it is not refined white and it is organic. Is that still not good? I switched to that in my baking. I was using regular white refined sugar. Pointless switch or a good one? Thanks. Organic sugar is definitely better than refined sugar. I would use it for your baking needs, but not smoothies. Try honey, maple syrup, stevia or more sweet fruit instead. use 1% milk most of the time, and been on an ice cream making kick. Of course, it will call for creamer and whole milk, so I just use what I have which is half and half. I also will use low fat or non fat sweetened condensed milk in place of full fat condensed milk. Do you have any recipes for smoothies that will boost my metabolism, and help get rid of belly fat for good? Hi, one thing about Stevia first. If you use the green powdered stevia, it has a positive side effect, it stimulates the pancreas into producing its OWN NATURAL INSULIN. You can also grow your own to ensure that it truly is ORGANIC. I used to be a sugar fiend, now if I want to sweeten, I usually use the green powdered Stevis OR “Date Molasses” which most Indian or Polish shops or similar sell. Thanks for sharing, did not know that about stevia, Maha-Abu. Always best to grow your own. True. However, I still opt for organic cane sugar for my kombucha. Have you tried Truvia, Nectar/Stevia blend with honey. For things like tea and coffee I have been enjoying it. I usually don’t need sweeter with the smoothies, but like having something I could use when the strawberries are not so sweet. Your comments/thoughts on the product. I have not tried it, RC. It appears legit. However, not being organic is something that would cause me to avoid. So i live with sugar craving all my life. I finally substituted Monk fruit powder packets and agave. For about 9 yrs now that the only sweetners I use. What about honey, maple syrup, and stevia, Emma? Those are all healthy and viable. What about Frutcose? Are they ok? Fructose, or fruit sugar, is perfectly fine, Lynn. I thought any sweetener that ended with “ose” was bad.??? Sugar in fruit is not bad when consumed in moderation, Kathy. Hi,is agave syrup safe to use in smoothies,shakes,cooking or baking recipes for diabetics? I have type 2 diabetes and sometimes it can be challenging to control my blood sugar but I do try really hard to keep my blood sugar under control,I check my blood sugar 4 times a day and I am on insulin twice a day now. I do not recommend agave syrup, Kim. It’s not a health sweetener. Hi,I was at winners store in Edmonton and there was a container of coconut sugar on the shelf.can I use coconut sugar in your healthy smoothies.will it put up my blood sugar a lot?being a diabetic for five years now and would it be safe and OK to use this type of sugar in smoothies. I go to the health food store to buy the stevia packets that I use in my smoothies and in my tea that I enjoy drinking. Coconut sugar is a healthy sweetener option. However, I would advise against if you’re diabetic. Stick to something much lower on the Glycemic index such as stevia. What about brown, sugar in the raw, what is the conventional wisdom about it? Does it have as many calories as and will it raise your blood sugar similar to how white, refined sugar does/will? Brown sugar is only slightly better than white, refined sugar, Lisa. I would avoid it in favor of the sweeteners listed above. I have tried Stevia for YEARS and cannot find a brand without that horrible aftertaste. Any brand suggestions?? Thanks! Have you tried the stevia herb – green, not the white stuff? I will try that! Thank you so much! Hi, you haven’t mentioned dates anywhere.. I use them most of the time to sweeten my desserts. Dates are a great fruit to sweeten with, Christina. I didn’t mention because I don’t consume them very often.